Before the rolling thunder which shakes us from our marital beds, there is a flash of lightning. A flash which may go unnoticed by some, but seen and revered by others as the all powerful hand of the mighty Zeus. The bright light heralds the coming of a storm. A storm, of SPIDER! We were admittedly blown sideways by the internet reaction to this piece, which started its life as an end-of-studies 16mm film assignment. The reaction showed that even if people didn't understand the humour and/or stylistic influences involved, they were swept up in it's sheer ridiculousness, and for the most part, people really got into the spirit of the concept; reveling in the completely retarded, over-the-top character and his remarkable adventures. 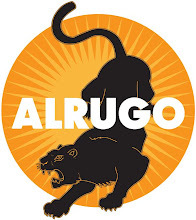 Thanks goes out to all the blog writers, webmasters and general viewing public which, to date, have helped net this original trailer upwards of 1.8 million views and make Alrugo a near-household name. Stay tuned little ones, stay tuned.